In my last blog post (read it here), I mentioned that the PBwiki Support Team has changed drastically in the way we handle our tickets and the way we measure ourselves. Another way we’ve changed is in the way we hire. In the beginning, PBwiki was used by a lot of early adopters of technology – people who were tolerant of some bugs, who enjoyed hacking around in the product, and people who would rather discover and learn for themselves than contact support. To answer the questions that did come through, we hired out of that same pool of users – we pulled 4 support gurus right out of the forums and they became the first PBwiki Support Team. The second thing we learned is that technical expertise can be taught. The talent and depth of knowledge of our first set of support gurus is invaluable and irreplaceable. As we looked at hiring more support agents, we found that PBwiki experience was not a necessity, what we needed to focus on was hiring for some core values: professionalism, accuracy, speed, and personality. The technical experience can always be taught and learned (in fact, each support guru is encouraged to spend time each day exploring their own wikis). One of our support gurus, Angie, is a great example of our hiring story. Angie applied to work with PBwiki having never used PBwiki. However, Angie possessed other skills that made her a great hire – her communication and responses to hiring emails were instantaneous and her personality shined right through. Angie also possessed another key quality- patience. As a stay-at-home mom to five children, Angie has lots of experience balancing multiple tasks and answering questions. Angie has been with PBwiki for just three months and has picked up all the technical ability to answer most PBwiki questions. When Angie started with us, she was answering basic questions like how to log into a wiki or how to add an image – questions that could be easily answered by pointing to a section on the user manual, or sending step-by-step instructions. We saw that Angie was responding to people quickly and professionally, and we she asked for more hours at PBwiki, we were happy to give them to her! Before long, we saw Angie answering questions about custom CSS and advanced features. Angie had a personal wiki where replicated different scenarios to learn, fully understand questions, and build her skills. The key takeaway is that PBwiki isn’t just offering its services to early adopters of technology. We’re offering our services to teachers, children, business people, and everyone in between. In order to connect with all these different users, our support gurus need to be able to understand their needs, their frustrations, and their situation before getting to the technical meat of the question. Our support team is a mix of these skills, and it’s been amazing to watch the support team members advance their skills and knowledge of our product. One of the things we’re focusing in on at PBwiki is how we can become a better support team. When PBwiki launched back in 2005, we had no formalized support, just a forum that our users chatted on. We found a few amazing people on the forums and invited them to join our PBwiki team as Support Gurus. I started working for PBwiki in mid-January 2008. At that time, we handled all support requests through a Gmail email account. As different support agents came to work, we would answer emails from our users. If a ticket needed attention by someone else, it would get starred. We had labels, tags, and a bolding/unbolding system to indicate different status levels. As PBwiki grew, we knew that we couldn’t continue using this system any longer. It was too easy to forget about someone’s case, we weren’t measuring anything, and we had no real accountability to our users. Then Paul Singh joined PBwiki as Director of Support. Paul likes to call himself “Mr. Metrics” because of his love of measuring, analyzing, and breaking down data for consumption. One of his first moves was to take the support team away from Gmail and introduce us to Salesforce. As a newer PBwiki employee, I loved Salesforce. However, it was a difficult transition for some of our support team, who had been used to the easy, but limited in functionality, Gmail support account. Moving to Salesforce was hard, especially as we figured out its limitations and adjusted our workflows. While using a Gmail account for support was simple and easy, it lacked in accountability and measurables for the support team. Now that we use Salesforce, Support has a more complex system, but we’re better able to measure and gauge the work we do. We can now pull data on every aspect of the support experience, from what the ticket is about, response times, and satisfaction rates. 1) Response Times: PBwiki aims to respond to all users in a set amount of time. Each of our support team members is measured on how quickly the respond to tickets. 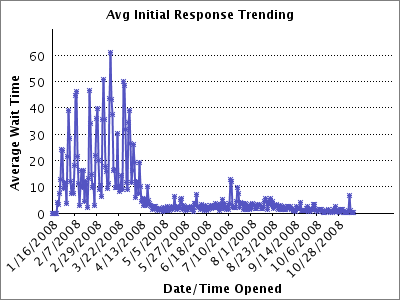 Our average initial response time has dropped from nearly seventy hours (January 2008) to two hours (October 2008). That’s twenty-four hours a day, seven days a week. 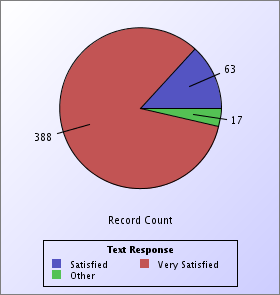 2) Satisfaction Rate: Answering emails isn’t the whole of what we do in PBwiki Support. We get to know you, get involved in your projects, and help you each step of the way. That’s why we enforce the idea of quality over quantity. A great response time means nothing if users are unhappy. It is up to our support team to make your day and make sure you walk away saying that your experience with PBwiki Support was the best customer support experience you’ve ever had. We now have a tables, charts, graphs, numbers, and statistics that help support communicate the voice of the user to the rest of the company. Now the support team is taking these metrics to help us respond quickly, efficiently, and effectively to your support inquiries. We’ve come a long way from the user forums. The decision making has become highly fragmented – from marketing, to sales, to engineering, to services and so on. The problem is that the improvements are inwards focused and don’t lend themselves to creating metrics around the customer experience. Customer service managers have a hard time getting customer service improvements prioritized properly – database upgrades, infrastructure, security, etc – these things eat up 99% of the customer service budget. Find ways to enhance customer service capabilities without scrambling for capital expenditure approvals and without bugging IT. This benefits the customer and the IT manager – SaaS is perfect for this. More appropriately, PBwiki is perfect for this. We know most customer service related deployments take time. Integration and system change take time – with complex customer service systems, it can take months and even years to get things running properly. Instead, use PBwiki to centralize your product information, best practices or other proprietary knowledge so that your workforce is empowered.